We were recently blessed with a Lifetime Membership by Homeschool Copywork. The Lifetime Membership gives us access to a huge assortment of copywork goodies for all grades, even high school! There are currently 54 eBooks with hundreds of pages of copywork covering a wide range of topics such as art studies with copywork on Van Gogh, Da Vinci, and Monet, music with Mozart, Bach, and others, Hymns, Poetry, Presidential Quotes, Human Body, Short Stories, holidays, coloring pages, and more. Homeschool Copywork features varying levels of difficulty and length to challenge even your older students, while providing all the benefits of copywork. With so many different options to choose from, there's something for everyone and every subject. We are an eclectic family, so our topics of choice are constantly changing. 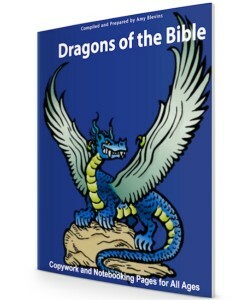 We have been studying zoology that includes dinosaurs lately, so we started with Dragons of the Bible Copywork, Notebooking, and Coloring Pages. This particular book is 154 pages, so I scrolled through it and picked out some of my favorite pages to print each week, instead of printing the whole thing at one time. That's the best part of PDFs! You get to print as you go. This book starts out with block letters and lined pages and progresses to cursive and solid lines. It ends with dragon coloring pages. I had Mr. B work mostly with the block letters. We would do 2 block letter copywork pages for every cursive letter page. Cursive is still quite difficult for his poor fine motor skills to handle at the moment. I also had him color the pictures that were included with each copywork page. We also dabbled with some other books, like the Star Spangled Banner Copywork book. This lovely book features the Star Spangled Banner, line by line. Being a former all-county and all-state chorus member, I know so many who do not know the words to our nation's anthem! This is a great way to teach it to your child. I thought this would be the perfect compliment to our science studies and I was right! I really like how I can have him work on making his handwriting neater with both block letters and cursive in the same product. That is very handy! I love the content, and the Christian basis for everything, too, but I do wish there was a search feature so that I could do a search and pull up exactly what I'm looking for. Mr. B enjoyed the Bible verses he was to copy, and he really liked going back and forth between cursive and block letters. I will admit, I used the color sheets included to make my own adult coloring book! I can't help it, I love to color! I find copywork to be grounding for Mr. B when he's stimming or overly hyper. It's also good for his fine motor skills. The Lifetime Membership from Homeschool Copywork has given us an abundant supply of copywork pages so that should Mr. B tire of a single topic, and we can easily switch to something different. From a special needs perspective, Homeschool Copywork is really nice for multiple reasons. You can target academics in a low stress way, work on fine motor skills and penmanship, as well as communication skills. copywork is a very versatile tool for special education, and Homeschool Copywork presents a wide variety of topics from which to choose. Does Homeschool Copywork Pass My 4 Ingredient Test? With the Lifetime Membership you have access to everything Homeschool Copywork has to offer. There is no set schedule, or anything like that, so you can easily integrate how you see fit. There are no hidden fees. This is a full membership that does not expire. You are not licked into one grade level, but rather you have access to all grade levels. The copy passages vary in length between the grades, and even within the same book. The ability to color the pictures on each page is also a fun addition. Yes! There's a wide range of topics from which to choose that will cover a great deal of subject areas. 100 other Crew reviewers were blessed to also review Homeschool Copywork. Please click the banner below to check out their reviews!